One busy Thursday, I took the last flight for Manila to pursue a postponed trip. 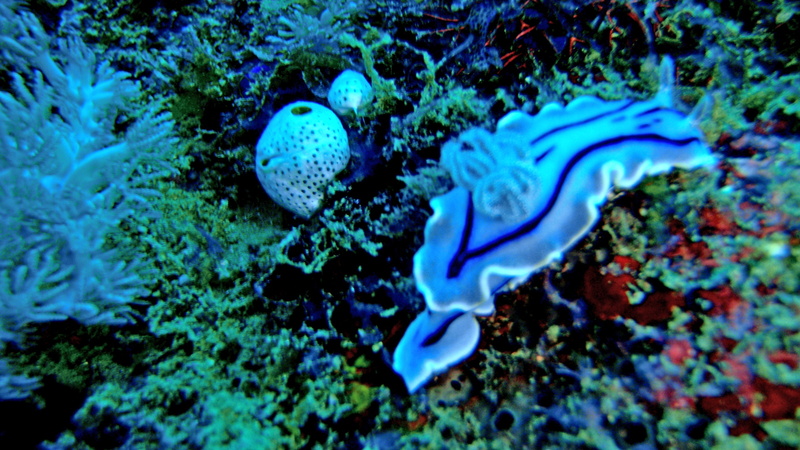 The random decision to be in Puerto Galera for weekend dives turned out to be a surprising discovery of its depths! Though this place wasn’t in my priority list, it was the most practical option to fill-in our schedule. I have always known PG for its beaches, crowds and parties. Personally I shunned crowded beach, it isn’t my cup of tea. And Puerto Galera is exactly like that as I’ve seen in the media. Threatened by continous rains in the metro, I was hoping and crossing my fingers that the waters would favor us. It was almost seven weeks from my last dive, I direly needed the waters for my dried-up gills! Arriving Sabang, which is 5.5 kilometers away from downtown PG late afternoon, we were thankful we arrived safe after a detour to Calapan City. Indeed, the district is bustling – stores, restos, bars, and people filled the area. Dive resorts and shops lined up along the shore. It was a relief when we finally got into our lodgings, at the same time too our dive operator. The next morning promised a sunny day, we gathered up our gears and reported at the dive shop, to meet our DM for some briefing and choosing the sites. I was requesting if we could make the Hole in the Wall, I just thought the spot is unique and it was intriguing! DM Guy was helpful affirming for the Hole in the afternoon dive. A mall wreck at monkey beach! Our first descent was at Monkey Beach not far from the area, the visibility wasn’t really good but manageable enough as we don’t need beyond 10 meters for exploration. 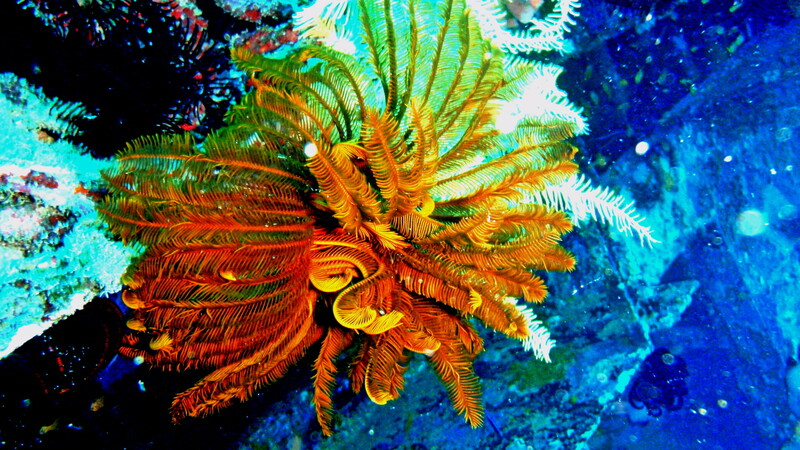 It was a sandy slope patched with colorful crinoids and with active fish life. We spotted garden eels, puffer, trumpetfish, scorpions, large rabbitfish and morays. 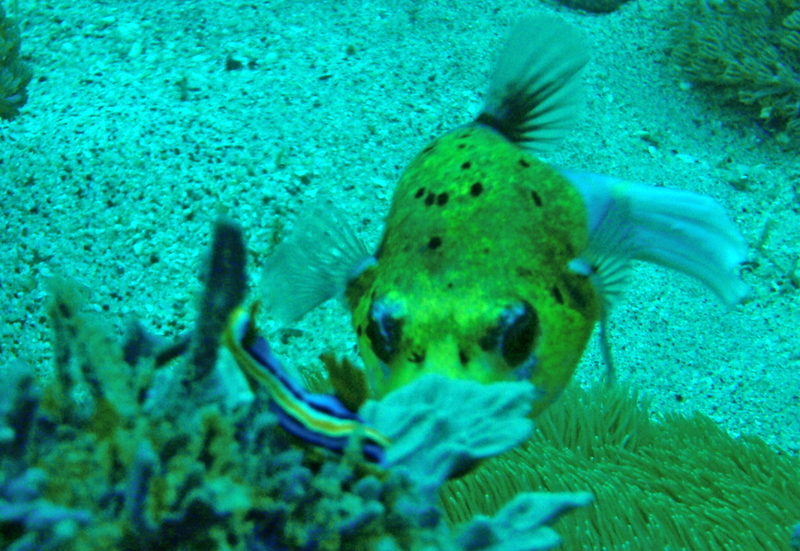 Angel took fancy of the juvenile lionfish for its photos, there were nudis too scattered in the area. 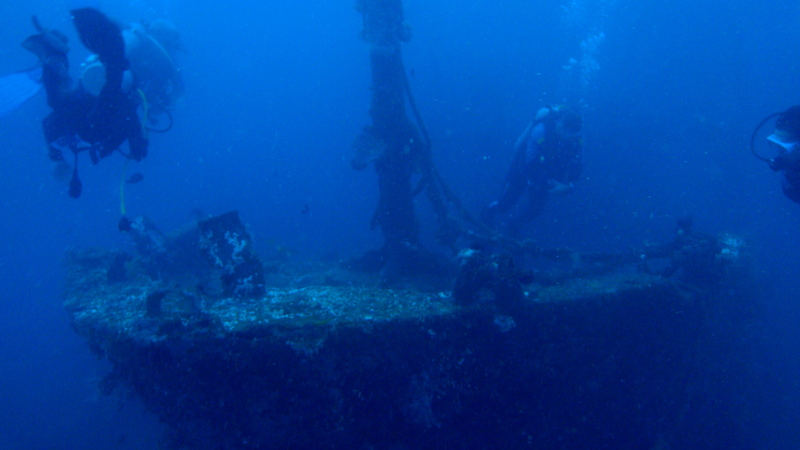 It was an easy dive but what delighted us most was the small wreck there lying on its port side. 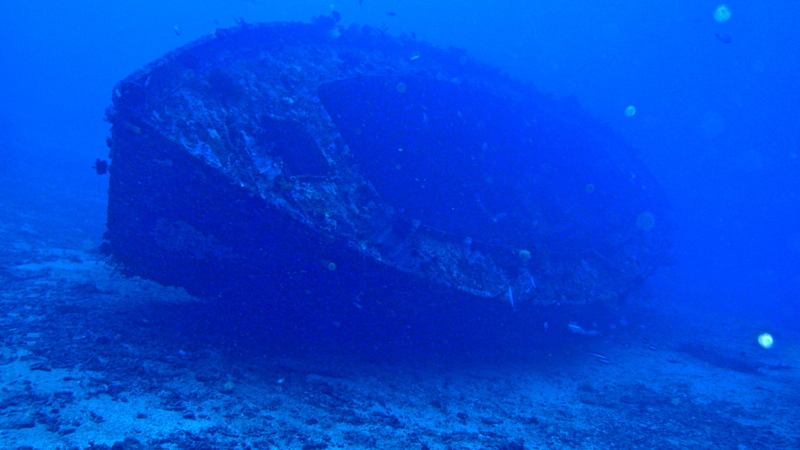 It was a steel boat now encrusted with hard corals and crinoids. It perked me up as we go round, and that familiar rush to swim inside – just love the mystery! 🙂 But the DM just watched me and gave no clue to penetrate. Peeking inside from window bars, I watched the active fish life inside. After 49 minutes we ascend with my 90 bars air left. but the lights didn’t disturb him, he opened his eyes and closed it again after seeing us. And I did touch him and he allowed us to do that! The second wreck was small lying on its port side on the sand and also encrusted with corals. As we went along, a school of small sardines appeared above us. The last wreck was some wooden boat almost devoured but the engine still in tact, some remnants of its hull still there, a reminder it was once there. We had finally our safety stop on a sandy area with coral garden. We surfaced at the front of the dive shop, so we decided to swim back to the shore as the boat was nowhere in sight. I have no choice but to walk back to the diveshop with the gears on my back, which I really don’t like until now. Our leisure pasta lunch in a deserted Italian resto served as our surface interval and rest. We were equally eager for the third dive for the Hole in the Wall, and while DM Guy briefed us I was asking many questions, especially it was known to be with strong currents. At past 2pm, we descend at Escarceo Point on a sandy slope then to a wall filled with hard and soft corals and colorful crinoids, the visibility was not really good but very manageable. There was strong current (!) and we drifted fast, I was on alert not to be far from our DM and so with Angel, although managing currents underwater is challenging I still felt jitters on it. We passed by corals, critters, sponges and colorful reef fishes and some pelagics obscurely drifting. Trying to stay close to the bed until we got to wall full of colorful corals and crinoids, our DM signaled and pointed to something. I tried to steady myself and followed the direction, and there the hole! I was looking for Angel but he was above us a little farther. DM Guy went ahead and passing the hole was like in a flash! It was very quick, I was pushed by the current to the other side and Angel was there lingering on the coral garden. The current was still strong, we head back shallower on the gardens and got away from the current, I was stung with fire corals. 😦 We explore more during our safety stop on a sandy area, finding some nudis, moray, juvenile lionfish and more critters. We ascend after 51 minutes with my air still at 100 bars. We wanted to make most of our stay in Sabang, so Angel and I agreed to have one more dive the next morning, we were such thrilled as we will explore another wreck – MV Alma Jane, considered as the longest in Puerto Galera waters. So after a rushed visit to PG town for Sunday mass followed by a hurried breakfast back in Sabang, we got to the dive shop and geared up once more. The weather has favored us with bright skies promising a sunny day. Three more foreign divers joined us, a short ten minutes brought us to the area for the descent. We grabbed the bouy line as soon as we got to the waters, slowly descending. It was hazy at first until we caught sight obscurely of the wreck like a monster – though much smaller than in Coron. There lying upright on sandy bottom at about 30 metres, MV Alma Jane encrusted with patches of hard corals. We started our round on its starboard side going front, with those giant batfish decorating. Then on the port side going rear, with oversized rabbit fish swimming coyly. There were crinoids and sighted few small nudis. Ascending few meters, DM Guy signaled for the hull, so we came in tow – DM, me and Angel. And there, that same overwhelming feeling of discovering what’s inside, the mystery is too overpowering! Floating lightly, careful not to touch anything, the tour inside was short but it felt good! 🙂 We went shallower for the shaft, still in tact and few fish linger there. We sighted lot of stonefish camouflaging seated on flat steel surface on the mast. Ascending slowly holding again the bouyline until we had our safety stop, finally we surfaced. The whole wreck itself was a lovely sight! 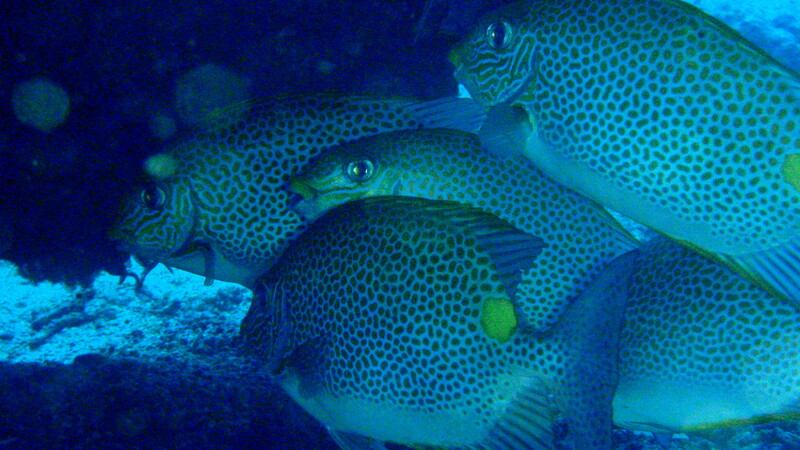 Indeed, the four dives was like a feast to me. It was a surprising discovery, the sites were marvelous and the wrecks added color to this random trip in Puerto Galera. Angel and I was impressed with the sites, we promised for a return perhaps not sooner but eyeing for Verde Island next time. The Lord was generous again with such luxury. Just last February, we were flying over Mindoro from Apo Reef, I recalled he was saying he is interested too with PG but I said vaguely we will do it sometime. I never planned for Puerto Galera but it was a wish coming true for Angel. Unplanned yet we were not disappointed, it was a remarkable experience. Sabang is 5.5 kilometres from town proper of Puerto Galera and can be reach by jeepney. Puerto Galera is 48 kilometers from the City of Calapan, about 1 hour & 20 minutes by van. Sabang can be reached by boat direct from Batangas City port about 1 hour and 30 minutes. My route for this trip was: Manila – Batangas – Calapan – Puerto Galera – Sabang. 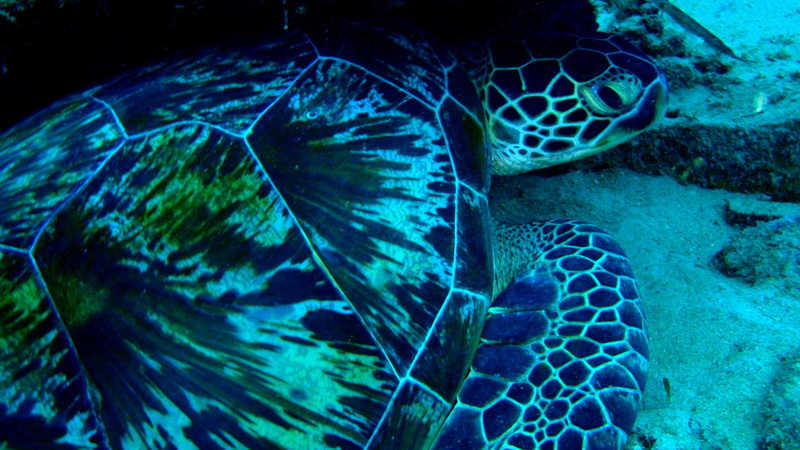 Pingback: Talisayan: More than the Usual « Life Beyond the Depths!